Rapid identification of microorganisms in medical microbiology can be of great value for selection of ideal treatments for patients for infections caused by bacteria, viruses, fungus, mycobacterium, and parasites. It enables actual reduction from conventional broad spectrum antimicrobial agents to specific targeted antimicrobial therapy. The various advantages associated with medical microbiology testing technologies over conventional manual systems, such as automated microscopy and serological testing have been the primary growth drivers for the global medical microbiology testing technologies market. According to the research report, the global medical microbiology testing technologies market was valued at US$2.1 bn in 2015 and is expected to reach US$3.4 bn by the end of 2024. The global market is expected to expand at a CAGR of 5.4% between the forecast years of 2016 and 2024. The various advantages of medical microbiology testing technologies are the introduction of automation in clinical microbiology. Prior to these technologies, the sector entirely depended on highly skilled manpower to receive, process, and interpret the outcomes from a wide variety of clinical specimens with limited aid from automation, which was subject to the risk of human error. Increasing outbreak of various diseases, rising incidence of infectious diseases, public-private investments in the field of life science research and increasing funding and research grants are the major factors driving growth of the market for medical microbiology testing technologies. Testing volumes on the whole are expected to increase by 10 to 15% every year for the next 20 years as number of geriatrics in need of health care continue to rise. Depending on the type of technology used in the medical microbiology testing technologies market, medical microbiology testing technologies are segmented into microscope, serological tests, and cell culture. Although the industry is witnessing increasing use of automated medical microbiology testing technologies by many end users for clinical specimen testing, hospitals and diagnostic centers are still considered as the key revenue-generating segments. These are thus likely to continue the lead in the coming years. This is attributed to the changing perception of people as well as healthcare practitioners. In terms of geography, Europe claimed the largest regional share for medical microbiology testing technologies in terms of revenue. 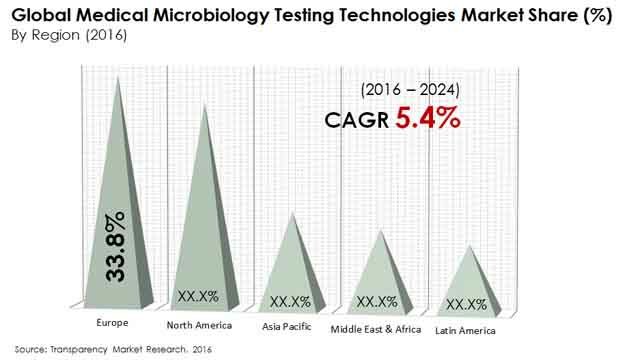 However, during the forecast period, the market in Asia Pacific for medical microbiology testing technologies will exhibit the highest market growth at a CAGR of 7.3%. High conversion rate from traditional testing methods to new advanced testing technologies is the key factors projected to trigger the market growth in APAC. The Asia Pacific region is also expected to lead product development and adoption of newer technologies. Improving economic conditions leading to increased purchasing power, increasing awareness regarding the benefit of testing technologies, and the presence of a large pool of patients suffering from various chronic diseases, the market is expected to grow at a double digit rate. The key players operating in the global medical microbiology testing technologies market are Agilent Technologies Inc., Becton, Dickinson & Company, Beckman Coulter Inc. (A Danaher Company) Biomerieux SA, Bio-Rad Laboratories Inc., and Roche Holding AG. This report provides forecast and analysis of the medical microbiology testing technologies market on the global and regional levels. It provides historical data of 2015 along with forecast from 2016 to 2024 in terms of revenue (US$ Mn). The report also includes macroeconomic indicators along with an outlook on medical microbiology testing technologies globally. It includes drivers and restraints of the medical microbiology testing technologies market and their impact on each region during the forecast period. The report also comprises the study of current issue and opportunities for medical microbiology testing manufacturers. In order to provide users of this report with comprehensive view of the market, we have included detailed competitiveness analysis and company players. The dashboard provides detailed comparison of medical microbiology testing manufacturers on parameters such as operating margin, unique selling propositions, collective market share, and geographic concentration. The study encompasses market attractiveness analysis, by indication, type, technology type, application type, end user type and region. The report includes usage of Medical Microbiology Testing Technologies and the revenue generated from sales of medical microbiology testing technologies in all regions and important countries in these regions. By indication, the global medical microbiology testing technologies market has been segmented into respiratory diseases, neurological diseases, infectious diseases and others. By technology, the market is segmented into Cell Culture, Microscopy and Serology. On the basis of application, the market is segmented into Diagnostic and Treatment Monitoring. On the basis of end user, the market is segmented into Hospital Labs, Pathology Labs, Research Institutes and others. Market numbers have been estimated based on average consumption and weighted average pricing of medical microbiology testing technologies and the revenue is derived through regional pricing trends and the epidemiology of specific diseases. Market size and forecast for each segment have been provided in the context of global and regional markets. The Medical Microbiology Testing Technologies market has been analyzed based on expected demand. All key end users have been considered and potential applications have been estimated on the basis of secondary sources and feedback from primary respondents. Regional demand patterns have been considered while estimating the market for various end users of Medical Microbiology Testing Technologies in different regions. Top down approach has been used to estimate the Medical Microbiology Testing Technologies market by regions. Market numbers for indication, technology, application, and end user segments have been derived using the top-down approach, which is cumulative of each region’s demand. Company-level market share has been derived on the basis of revenues reported by key manufacturers. The market has been forecast based on constant currency rates. A number of primary and secondary sources were consulted during the course of the study. Secondary sources include FACTIVA, NCBI, Google Books, company websites, journals, press releases, Morningstar, Hoover’s, and company annual reports and publications. The report provides detailed competitive and company profiles of key participants operating in the global market. Key players in the global Medical Microbiology Testing Technologies market include Agilent Technologies Inc., Becton, Dickinson & Company, Beckman Coulter Inc. (A Danaher Company), Biomerieux SA, Bio-Rad Laboratories Inc., Roche Holding AG, among others.